Exploring the beautiful worlds that exist just below the water’s surface doesn’t have to be something for trained professionals, oceanographers, and kids playing on the beach. If you are looking for the hottest spots to get your feet wet and have some great experiences snorkeling, these are those places. While there are certainly many more, these are ones we can personally recommend. The beautiful rainbow color coral that fills Rainbow Reef in Fiji makes it one of the places we highly recommend. There is also a huge variety of marine life thanks to the currents that bring large amounts of marine nutrition into this area. Aside from the beautiful colors, there is also a 150 by 200-foot wall known as The Great White Wall. It gets its name from the soft white color that is due to the white coral that covers the entire surface of it. If you plan on making a trip to Fiji, Rainbow Reef is definitely the place to go for snorkeling. The Great Barrier Reef is one of Australia’s natural wonders and it is also considered to be one of the seven natural wonders of the world. It attracts millions of tourists every year. It is actually comprised of nearly 3000 individual reefs that cover over 2600 kilometers. This ancient wonder is home to six different species of sea turtles, more than 1500 species of fish, and a large number of other types of marine life. 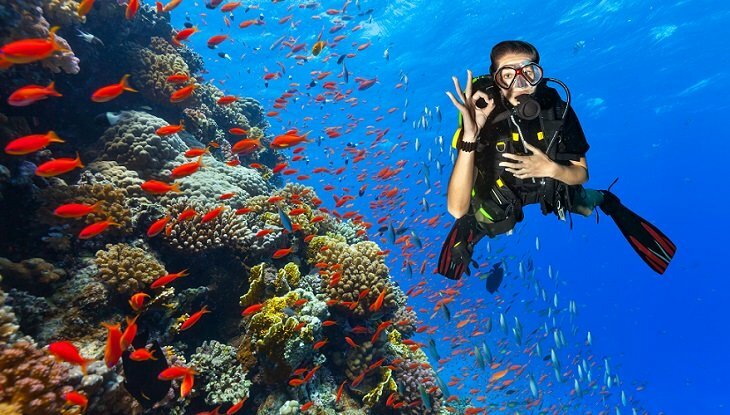 Though generally, it is a more popular location for scuba divers. With so many different reefs in a single location, there are multiple locations that are suitable for snorkeling as well. If you’re planning a trip “Down Under”, don’t forget to make a trip down under the water’s surface to explore The Great Barrier Reef. The Caribbean is a hot spot for snorkelers and non-snorkelers a like. With crystal clear blue waters and hundreds of destinations to choose from, it’s no wonder people flock to the Caribbean for a tropical getaway. If you are looking for a great place to start, check out Buck Island in St. Croix. The reefs that surround this island are protected by the U.S. National Park Services which helps to keep them lush and beautiful. Located just 2 miles off the north shore of St. Croix, it is open to snorkelers and scuba divers. People visiting this protected place will be able to experience over 250 species of fish, not to mention the other forms of marine life and the beautiful coral formations. This really is a great place to visit if you find yourself vacationing in the Caribbean. When people talk about the Komodo National Park, the first thing they mention is not snorkeling. The park is actually an island, one of five islands in the world, in fact, that is home to Komodo Dragons. Visitors to the island can see the Komodo dragons in the wild, in their natural habitats. This national park is a World Heritage Site which means it is protected. Thanks to the protection provided to it, the island and the reefs surrounded the island are filled with amazing wildlife and marine life. If you are snorkeling in Indonesia, the Komodo National Park is really the best of both worlds. You can experience the beauty of the land and under the sea. If you are looking for a place to escape the tourists and locals alike, check Vieques, Puerto Rico. Due to the history of the island of Puerto Rico, much of the island was never developed because it was once used as a military base. Vieques is one of those still undeveloped locations that you can easily escape to, so you can avoid the large crowds of snorkelers, divers, swimmers, and surfers. There is plenty of clear, shallow water filled with a variety of marine life just waiting for you to explore it. Since the beach and areas surrounding it are undeveloped, you don’t have to worry much about overcrowding. Before you decide to just dive into the ocean and start exploring the beautiful worlds that are hidden there, you should probably slow down a sec. There are a few things you should take into consideration before you start snorkeling. Though snorkeling is considerably safer than scuba diving as you remain close to the water’s surface, there are still risks involved, such as rashes and burns from exposure to sun and a risk of drowning if you don’t use the proper safety vest. Other risks may be location based. For example, some locations may have sea creatures that you should take use extra caution in trying to avoid them, such as jellyfish. Rip currents are another risk you may encounter. It is best to ask your guide or even ask locals of things you should know before getting in the water. There are certain locations that are sanctuaries or protected locations, including parts of the ocean where snorkeling is illegal. Make sure you know the laws and locations where snorkel is permitted. It is never safe to go snorkeling alone. If something were to happen and you were to be injured, there would be no one there to help you. Even experienced snorkelers should have a snorkeling buddy. At the very least, find a local guide who knows the waters and what to do in case there is an emergency. It is certainly better to be safe than sorry. Plus, underwater adventures are more fun with a friend! This might sound a little strange but if you want to make sure you are ready to go snorkeling for real. Or if you just want to avoid looking like a newbie on your first time out, practice. Find a swimming pool or somewhere you are familiar with and practice things like putting your mask on and off, swimming with fins, and breathing underwater with the snorkel. If you take a little time to practice, you will at the very least be a little more comfortable and be able to relax your first time. Being prepared seems a little obvious but if you want to really enjoy snorkeling, make sure you are ready. This means knowing where you are going, having someone with experience there to help guide you and having all the equipment you need and know how to use that equipment. You will have a much more enjoyable experience and be more relaxed if you are prepared. As mentioned, part of being prepared is having the equipment you need and knowing how to use it. 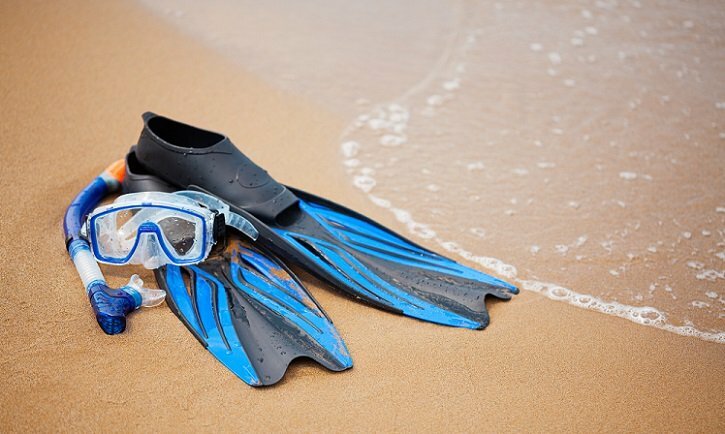 Most of the time, you can rent all the equipment you need for snorkeling at shops near snorkeling hot spots, though there are a few reasons you may want to consider bringing your own equipment. You can easily rent a mask for the day and they are relatively inexpensive, depending on where you are going snorkeling. You may want to consider bringing your own mask, however. If you bring your own snorkel mask, you can ensure that it fits your face and works properly to both hold the snorkel and keep the water out of your eyes and nose. If you aren’t planning to go snorkeling regularly, renting is an option. The snorkel is the tube that sticks up out of the water that allows you to breathe when you are near the water’s surface. One end is put in your mouth while the other end is open and above the water’s surface, so you can stay underwater for extended periods of time. You may want to consider renting your own if you are afraid of germs or you don’t prefer sharing with other people. Though they are thoroughly cleaned after each use, you may want a little peace of mind. You may be thinking, “I don’t need fins. I can swim without them.” This is very true, but snorkeling fins make a huge difference. They become very important when you are swimming longer distances as they help to propel you through the water and cut down on the energy you use when doing so. You can but you can also buy a set of snorkel gear as well so you done have to buy everything separately. The equipment listed below isn’t necessary, especially for beginners, but you may find it helpful as you become more and more of a snorkeling enthusiast. A wet suit is also known as a rash guard. Though a full body wetsuit is not required, you might want to consider a wetsuit or at least a shirt. This will be very important if you are planning on snorkeling for a whole day. Even though you will spend a lot of time underwater, you will still be exposed to the sun and any skin that is uncovered is at risk of being burned. This is also true for wind burn if there is a strong wind. If you choose not to wear a shirt or wetsuit, make sure you slather yourself in sunscreen. I can’t express how important it is to protect yourself from the sun, especially your back and shoulders. Don’t forget about the backs of your legs. It is a good idea to reapply throughout the day as well, even when using waterproof SPF. If you are just starting out, it is important to keep certain things in mind. The instruction books and websites, as well as the instructors themselves, will always tell you the basics, but these tips will help you enjoy your snorkeling adventures even more. As a beginner, you will likely feel nervous or possibly even uncomfortable until you get used to the way the equipment feels and works. The most important thing you can remember is to breathe and relax. It doesn’t matter what is going on around you. If you find yourself starting to panic, close your eyes, breathe in through your mouth with the snorkel and just let your body float. This will help you to calm down so that you can enjoy your snorkeling experience. You don’t want to touch anything while under the water. As a general rule, water and sand are the only things you should be touching. This means you need to pay close attention to your fins so you don’t accidentally kick part of the coral reef or a sea creature that may be near you. You don’t want to risk damaging or injuring something. Also, you don’t want to hurt yourself by touching a sea creature that could potentially sting or bite you. For your safety and the integrity of the underwater world, the rule is: look but don’t touch. This cannot be stressed enough. That is why it is included both in “Snorkeling: How to Get Started” and “Tips for Beginner Snorkelers” because it is very important. For your own safety, don’t go snorkeling alone. Snorkeling is supposed to be fun, don’t add extra dangers by choosing to go alone. Find a friend and have some fun. Tip #4: Don’t be Cheap! Whether you are renting your equipment or buying your own, don’t get the cheapest equipment they offer. You don’t have to go for the most expensive either. Find a happy medium that is within your budget. Buying the cheapest stuff can ruin your snorkeling excursions. Leaky diving masks, loose-fitting fins, and snorkels that just do work quite right are all possibilities when buying or renting cheap snorkeling gear. Keep this in mind before you make your decision. Pay attention to what is going on around you. Knowing your surroundings is important for your personal safety as well as the safety of the ecosystem that you are exploring. Make sure you are watching out for marine life and you know where your fins are. Make sure you know where your snorkeling buddy or group is at all times. Also, pay attention to where you are and how far you venture. Even if you are with another person, you don’t want to venture too far unless you are with a guide and following their path. Whether you are just learning about the joys of snorkeling or you want to learn more about this fun and rewarding hobby, there are always resources available that can help you get the most out of your time in the water. Let’s look at some! This website has a long list of places around the world you can go snorkeling. From Central and South America to places in Africa and Asia. There are even places in Europe and of course, you can’t forget about Australia. For each place that is ranked on this list, there is a nice picture of things you might see and a good description of why that island made it into the top 25 best islands for snorkeling. If you have ever been snorkeling or after you go for the first time and you decided that you want to give back, OneGreenPlanet might be a site you want to take a look at. If you are interested in helping to protect the beautiful oceans and coral reefs that you got to observe and experience, there are several ways you can do that. This website lists four charities that are specifically focused on helping to save the ocean, prevent global warming, and make sure that people can enjoy the beautiful wonders below the water’s surface for many years to come. This website starts with a good introduction to snorkeling. It also includes reasons why snorkeling is a good start or may be better than scuba diving. This website includes 10 safety tips to make sure you are prepared and stay out of harm’s way. Though snorkeling is significantly safer than scuba diving, there are still risks. It is important to know what they are and how to respond if a situation arises. This website will give you what you need to be prepared. If you decided that you want a mask that is perfect for you, you will want to check out this resource. With detailed information about different parts of a dive mask. It also includes information about special features like a purge valve. Before you purchase anything, have a look at this buying guide. You don’t want to become overwhelmed or end up with a snorkel mask that is underwhelming. Ready to Enjoy an Underwater World? There is literally a whole new world under the sea just waiting for you to start exploring. What are you waiting for? You have everything you need to know to get you headed in the right direction. Now you just need to decide on your first destination, pack your bags, grab a snorkeling buddy, and dive right in!